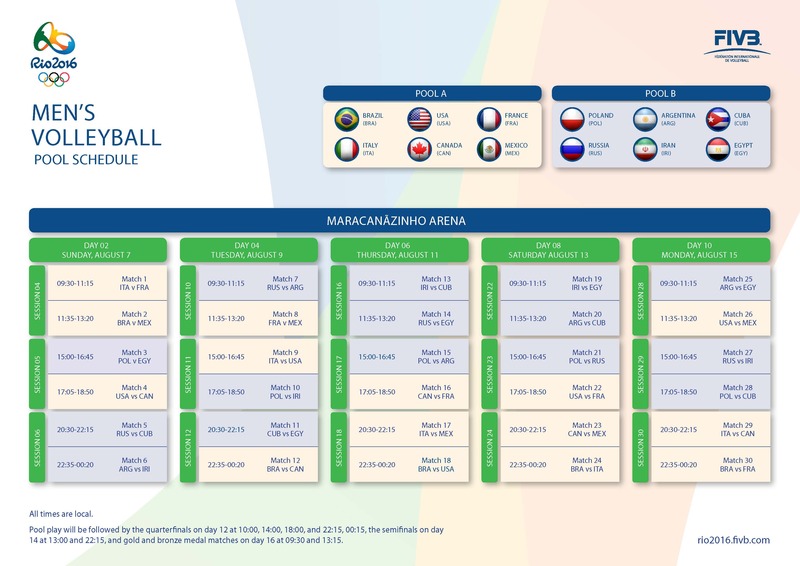 Lausanne, Switzerland, June 15, 2016 – An all-European affair will open the Rio 2016 Olympic Games men’s volleyball tournament, with FIVB Volleyball World League champions France meeting Italy in the first match after the full schedule was finalised. Hosts Brazil will then take to court at the Maracanãzinho Arena, facing Mexico who will be competing for the first time since 1968. Poland and Egypt will then meet in Pool B’s first match before USA and Canada clash in an all-NORCECA face-off. Defending Olympic champions Russia then take on Cuba before Argentina and Iran – also making their Olympic debut – round out the opening day’s action. With world No.1 Brazil and world No.3 Russia both in different groups, fans will have to wait until the knockout stages to see a repeat of the London 2012 Olympic final. However, the home side will meet the same team they beat in the semifinals, Italy, on the penultimate day of the group stages on August 13. There will also be two London 2012 quarterfinal re-runs with both Poland and USA both aiming for revenge over Russia and Italy respectively. The Americans may not want a repeat of that quarterfinal loss, but will certainly hope to replicate their pool result against Brazil four years ago again in Rio. The world No.5 were the only side to beat them – with the exception of Russia in the finals – with a 3-1 win in the group stages. Poland and Argentina also met at London 2012, with the world champions coming out on top on that occasion. More recently, France and Brazil clashed in the semifinals FIVB Volleyball Men’s World Championship Poland 2014. In a famously long and epic encounter, the French – currently one of the form sides in the world – were downed in five incredible sets. Iran and Russia also met in fifth place battle at the same tournament, the European side coming out on top. The Rio 2016 Olympic Games men’s volleyball tournament runs from August 7 until August 21.